If you are looking to recreate the Battles of the pacific Warlord Games have created some additional scenarios for you to use. More of these will be released later this year in the "Empire in flames" supplement book. Below is a copy of warlord Games' Alligator Creek scenario. Because these scenarios can be hard to find I have posted them here for you. On the 7 August 1942 the United States Marine Corps landed on the strategic south pacific island of Guadalcanal and stopped the construction of a vital Japanese airfield. If operational this airfield would isolate Australia and New Zealand from their allies. US Forces complete the airfield and name it Henderson Field. Imperial Japanese Forces have left their base at Rabaul and are on the way to rectify this insult. Imperial soldiers begin their landings on the 18 August and immediately march towards Henderson. In their way stands a crocodile infested creek and a battalion of United States Marines. At 2000hrs on the 20 August, the battle began. Alligator Creek runs through the centre of a 4ft x 6ft gaming table. The creek will be 4ft in length and 6” wide. The creek terminates at the ocean sandbar which is 2ft wide and consists of soft beach sand. All units may move on the sand but require an advance order to do so. No units may run on the beach. The creek is waist deep which allows soldiers to cross at an advance move only. Tracked and wheeled vehicles cannot cross the creek. Soft cover may be placed anywhere on the board except on the beach. 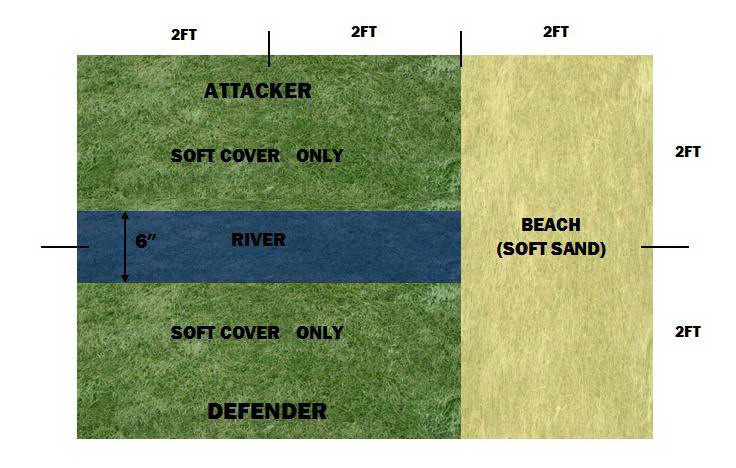 The jungle grew up to the edges of the river but players may place soft cover represent jungle at their discretion. 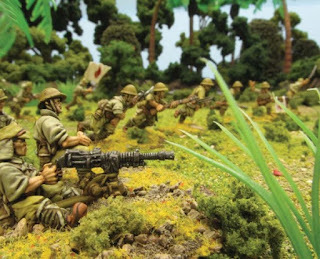 The USMC player may spend 700pts and select a force from the “1942-43 Guadalcanel Theatre Selector” on page 78 of the “Bolt Action Armies of the United States” army book. The USMC player may set up anywhere on their half of the table. The USMC player may start the game dug in (see dug in rule below). The USMC player sets up all his units on the table first. The Japanese player may spend 1000pts and select a force from “The Battle for Guadalcanal 1942 Theatre Selector” on page 45 of the Bolt Action Armies of Imperial Japan” army book. The Japanese player may set up anywhere 14” from their table edge. Pre-deployment, reserves, and Outflanking are not permitted in this mission. The Japanese player must cross the river. The USMC player must stop the Japanese. The battle for Alligator Creek began with a Japanese Mortar barrage. The attacker rolls a die, a preparatory mortar bombardment strikes the USMC positions. On a roll of 1, the barrage fails. Refer to the preparatory bombardment chart on page 118 on the Bolt Action rulebook. 6 turns. At the end of turn 6 roll a die. On a result of 1,2, or 3 the game ends. On a roll of 4, 5 or 6 play one further turn. If two Japanese units cross the river or the centre point of the beach and survive the game duration, the game ends in a draw. If three or more Japanese units cross the river or the centre point of the beach and survive the game duration, the game ends in a Japanese victory. If one or no Japanese units cross the river, the game ends in a USMC victory. (Note – Japanese units crossing to the USMC side of the river do not have to be fully intack to claim victory). A player may start the game with any of his units dug in. Place a marker next to the unit to display its dug in status. More adventurous gamers may model soldiers in gun pits. If a unit executes a run, advance or charge order, the unit looses the dug in status for the remainder of the game. Dug in offers -1 cover, and protection from HE. The number of HE hits caused by artillery is halved rounding down. Both sides fight simultaneously in Close Quarters if the target unit is dug in.